Narendra Modi’s government will inherit its predecessor’s dispute with Sri Lanka over arrested Tamil fishermen. Sixty-four Indian fishermen were arrested by the Sri Lankan Navy over several days in the past week. The arrests led to Tamil Nadu Chief Minister J. Jayalalithaa pressing Indian Prime Minister Narendra Modi to raise the issue with the Sri Lanka government to secure the release of the fishermen. Sri Lanka has arrested Indian fishermen in the past over fishing in disputed waters across the International Maritime Boundary Line that demarcates the maritime border between the two countries. Most of these fishermen are ethnic Tamils from the Indian state of Tamil Nadu. The issue brings to the fore the uncomfortable disagreements between India’s central government and the state government and legislature of Tamil Nadu. India’s relations with Sri Lanka have been colored by the ongoing friction between politicians representing Tamil interests in India and the central government’s desire to pursue pragmatic and closer relations with Mahinda Rajapaksa’s government. This latest incident will test the Modi government’s willingness to work with Tamil politicians such as Jayalalithaa who sit in opposition to the majority Bharatiya Janata Party-led government. Most recently, Indians in Tamil Nadu protested Modi’s decision to invite Mahinda Rajapaksa to his inauguration on May 26. Jayalalithaa’s party, the All India Anna Dravida Munnetra Khazagham (AIADMK), won 37 seats in the Lok Sabha in the most recent national elections — a strong parliamentary showing for a regional party. For her part, Jayalalithaa noted India’s previous central government’s willingness to work with the Sri Lankan government to release Indian fishermen from Sri Lanka and is calling on Modi’s government to find a permanent solution with the Sri Lankan government. “The Union government must impress upon the Sri Lankan government to abstain from attacks on and abduction of our innocent fishermen on the high seas in the Palk Bay. Further, the joint mechanisms which are designed to ensure the speedy release of apprehended fishermen should be effectively activated,” she noted in a statement. Fishing disputes have been a feature of relations between the two South Asian neighbors for some time now. Sri Lankan Navy personnel have on occasion fired at and killed Indian fishermen for fishing in the narrow Palk Strait. Sri Lanka has also arrested several Indian fishermen for crossing the IMBL. The Indian fishermen, the majority of whom are ethnically Tamil, largely allege that the areas in which they conduct their fishing activities should not be a major issue given that Tamil fishermen have traditionally operated in these areas. One source notes that around 530 Indian Tamil fisherman have been killed at the hands of the Sri Lankan Navy. The issue is complicated by the issue of Katchatheevu Island – an uninhabited island that India ceded to Sri Lanka in 1974 based on a conditional agreement. In 2009, Sri Lanka declared Katchatheevu sacred land given the presence of a Catholic shrine there – a move that was widely condemned by J. Jayalalithaa, the Chief Minister of Tamil Nadu (she wasn’t Chief Minister at the time but has become a vocal advocate for Tamil interests in Sri Lanka). Jayalalithaa has also condemned defense cooperation between India and Sri Lanka on the grounds that it ignores the interests of India’s sizable Tamil population. 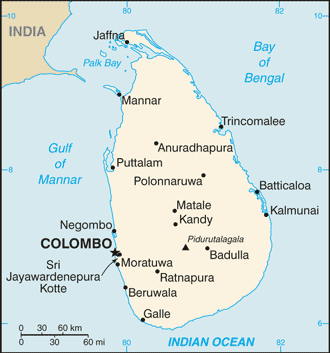 Katchatheevu isn’t a dispute between the central governments of India and Sri Lanka – the central government in New Delhi recognizes Sri Lanka’s sovereignty over the island per the 1974 accord. The issue has become a domestic political issue between Tamil fishing interests, Tamil Nadu politicians, and the central government. Katchatheevu falls under the the territory Tamil fishermen regard as “traditionally” belonging to them and want to preserve the right to fish there. Sri Lanka accuses Indian fishermen of illegally trawling its side of the Palk Strait.